You might remember a few short days ago when I said that I really don't get excited aout butternut squash. Well, that was before I had had it mixed with parmesan cheese, stuffed in ravioli and smothered in sage browned butter. This weekend, Mike and I stayed in on Saturday night and created a Ravioli Duo... homemade ravioli two ways. Actually, I wanted ravioli stuffed with Chicken, Spinach and Mozzarella in a Tomato Cream, and Mike wanted Butternut Squash stuffed ravioli in a Sage Browned Butter. And given my (former) evasion to butternut squash, I really didn't want it for dinner, but thought it would make a good blog post for those of you that do. Turns out... I do like butternut squash. Butternut Squash Ravioli, at least. We both loved the subtle sweetness of the squash mixed with the creaminess of the parmesan cheese and gentle spice of nutmeg. 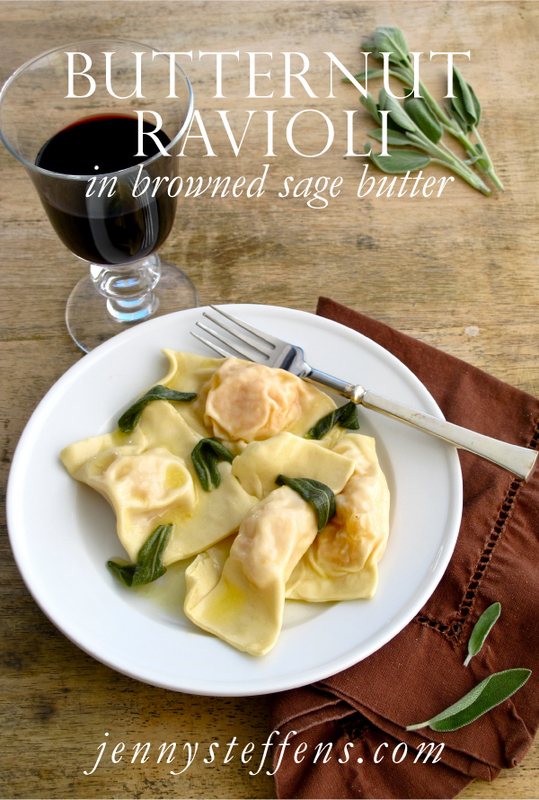 The Sage butter was the perfect compliment - you don't need much of a sauce with such a bold ravioli. Please, do not be intimidated by making homemade ravioli - it is so easy, I promise! All you need a rolling pin or this easy hand-crank Pasta Machine from Williams-Sonoma. If you absolutely do not want to attempt the homemade ravioli, use the filling and stuff it into giant shell pasta and serve it with the sauce drizzled over. 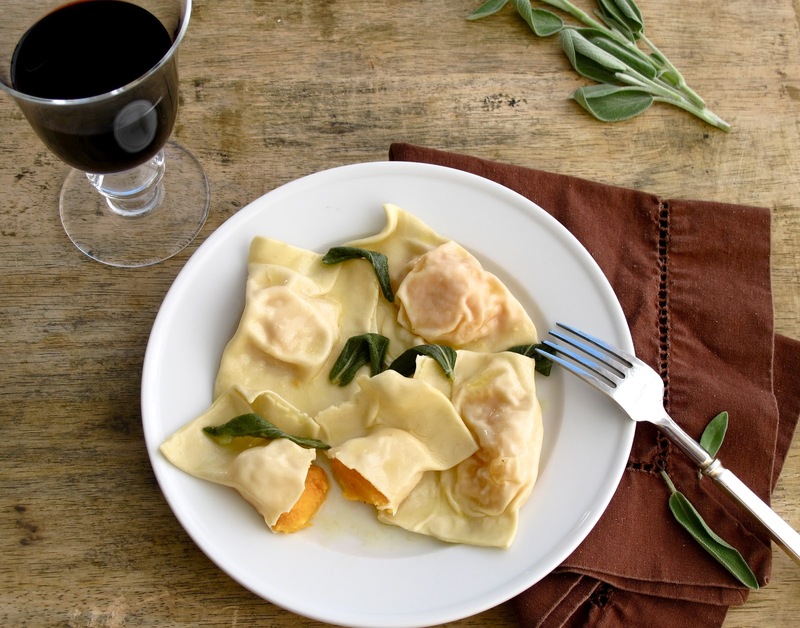 I think Butternut Squash Ravioli will definitely make my Fall Entertaining list - it would be great served as a first course, or as the entree for a dinner party. Visit my Fall Dinner Party Post for a complete Menu, Table Setting & Tips for an easy, casual Fall Dinner Party. 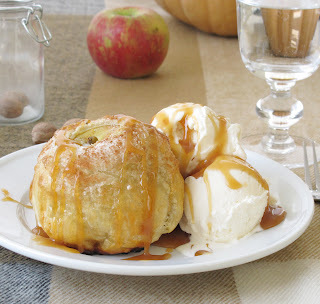 I am thinking Caramel Apple Dumplings with Cinnamon Ice Cream for dessert, for sure. You can see the tiny flecks of nutmeg in the squash filling. The Sage and Nutmeg made my kitchen smell sooo good - it smelled like Fall! Begin by cutting the squash into cubes and placing them on a baking sheet. Coat them with olive oil, salt & pepper. Roast the squash at 425 degrees for 25 minutes until it is tender. Put it in a bowl and mash it with a fork. Add parmesan cheese, nutmeg and salt & pepper, if needed. Place tablespoons of the filling down the center of the pasta dough that has been rolled into long sheets. Brush the dough around the filling with water, then fold the dough over lengthwise (making the filling of each ravioli be on one side, surrounded by dough on three sides. Cut the ravioli apart. Here is Mike rolling out the pasta dough into long sheets. He is always in charge of using the Pasta Machine and doing the rolling out. We got this old fashioned pasta roller and cutter after our honeymoon in Italy - we came back hungry for homemade pasta! I bought the hand-crank style because I thought the KitchenAid pasta roller attachment was too much of an investment, not knowing how much we'd use it. However, I have found that this hand roller pasta machine is no trouble at all - very easy to use! Put tablespoons of the filling down the middle of the long strips of dough. Space them about 2-inches apart. Brush the pasta with water using a pastry brush. Fold the dough in half length wise over the filling and pinch down over the filling getting rid of air bubbles. Cut the ravioli into pieces. Homemade ravioli shouldn't look perfect - any shape is fine! For the sauce, melt the butter on medium low, then add sage leaves. Cook for 2-3 minutes until the butter starts to brown. Remove from the heat immediately. Start with a KitchenAid mixer fitted with the dough hook. Dump in the flour, then top with the eggs. Put the mixer on medium and let the ingredients roll together until they form a ball. *You may need to add a little bit (1-3 tablespoons?) of water or flour if the dough is too wet or too dry. After a ball is formed, let the dough 'knead' on low-medium in the mixer for 5-7 minutes until the dough is elastic. Cover it with plastic wrap and let it sit for 20 minutes. When it is finished kneading, turn the dough out onto a floured board and kneed it by hand a couple of times. From this stage, you can roll it out by hand with a rolling pin (or bottle of wine! ), or put it through a pasta rolling machine. Either way is pretty simple. I've recently invested in this pasta machine that was very inexpensive. If you plan to make a lot of pasta in the future it can make things a little easier. By Hand : Roll the dough, flipping it, folding it and rolling it until it is about 1/8 of an inch thick. Cut it into 1" pieces with a knife, or a pizza wheel. After cutting, you can cook it immediately, or let it dry on a baking sheet sprinkled with flour too keep the dough from sticking. With Pasta Machine : Separate the dough into 6 pieces. Flour the machine and dough well to keep it from sticking. Feed it through the rolling/flattening part of the machine starting on the largest setting and progressing to a smaller setting each time you feed the dough through. I find that flouring it each time helps to keep it from sticking. After it has gone through the smallest (or 2nd to the smallest) setting, lay it flat. It is ready to but cut into any shape or used for ravioli! This is one of my favorites! Yum! I think I even had it in Boston! Wow! looks amazing! I just recently fell in love with Butternut Squash! Will have to try! This might be a silly question, but do you peel the butternut squash? This looks so delicious - I've never attempted homemade ravioli before, but you make it seem fairly simple! I looove butternut squash ravioli! Never thought to make it myself. Your ravioli looks fantastic!!! I think butternut squash and sage work so well together. If you like the butternut squash and parmesan combination, try them together in a creamy risotto. It's one of my favorites on its own, or next to a slice of rosemary garlic pork loin. this is the perfect Fall dish. it looks so delicious. my mom used to make something similar and would sprinkle crumbled amaretti cookies on top! Mouth watering!!! looks delicious. will have to try butternut squash with cheese together. Am hosting a lunch in November and was thinking of making homemade pasta, so this would be prefect to serve. Just wondering how many servings or how many individual raviolis does your recipe make? Depending on the size you make them, it should yield about 24-30. Do you have any suggestions for a healthier sauce than the butter sauce? Would tomato sauce work, or maybe olive oil tossed with sauteed garlic? i add marscapone cheese, fresh grated locatelli and an egg to my filling, delish! Will definitely try your recipe. Always looking for easy recipes.